First quarter sales are off to a good start. The 2,367 sales transacted in the first three months show a 6% increase over the same period in 2018, and only a 3% dip from the record-setting years of 2016 and 2017. Similar to sales, there is a 6% rise in year-to-date listings with more than 5,400 entered on the MLS®. Dollar volume of close to $700 million is up 7% from 2018. March sales of 1,009 resulted in nearly a 4% gain in comparison to March 2018, while dollar volume of just under $300 million edged out last March by less than 3%. The 4,212 active listings sitting in inventory at the end of March are 8% higher than they were at the same time last year. March single-family home sales activity was most active in the $300,000 to $349,999 price range and therefore supplanted the next lower price range of $250,000 to $299,999. March 2018 was the exact opposite and by a 45 sales margin. Now more than one in two single-family home sales occur over $300,000. It will be interesting to see if this will become the norm as the year progresses. The shift in sales activity to higher price ranges is a gradual process in a stable market such as Winnipeg’s. Of note in March - when you compare it to last March - are the rural MLS® areas as a whole, which represented 26% of total single-family home sales, and saw its average sale price increase from $315,595 to $323,873. The northeast area of Winnipeg also saw a small bump up in its average sale price to $289,857, and a 17% increase in sales activity. These two developments alone help explain the upward movement in sales activity. Condominiums sales were virtually the same as March 2018 with price range activity nearly a repeat of last year with percentage of sales under $300,000 being at 87% and 86% respectively. The most active price range was from $150,000 to $199,999 though this March captured 35% of total condo sales while March 2018 was less at 27%, owing to more activity in the lower price range from $100,000 to $149,999. The average single family home sales price in March was $326,433, whereas the condominium average sale price recorded was $227,538. Speaking of affordability, RBC’s March 2019 Housing Trends and Affordability Report shows that in both Saskatoon and Winnipeg you are better off owning an average-priced condo apartment than renting a two-bedroom apartment. service the cost of mortgage payments (principal and interest), property taxes, and utilities based on the average market price of all housing types in any given market. This year’s federal budget increased the Home Buyers’ Plan (HBP) withdrawal limit from $25,000 to $35,000, and extended the HBP to those going through a marital breakdown so they can use their RRSPs to put towards a down payment on a home. These changes are effective immediately. The federal government will also carefully monitor the federal mortgage stress test, given industry concerns over how these new regulations are unnecessarily creating unintended consequences on housing markets which are in balance - or even struggling - compared to overheated ones. “Be it changing market conditions within the various property types or new budget measures affecting housing, you should be calling your Realtor to keep abreast of what these changes mean as you try to better understand and navigate the housing market,” said Marina R. James, CEO of WinnipegREALTORS®. recent changes to the HBP and PST, we have much to be optimistic about. Since 1903, WinnipegREALTORS® has assisted its members in achieving high levels of excellence in organized real estate by providing superior tools and services that enhance and build a vibrant real estate industry. Representing over 1,975 REALTORS® and other industry related professions active in the Winnipeg metropolitan area, WinnipegREALTORS® promotes the value of a REALTOR® and organized real estate. WinnipegREALTORS® provides its members with essential market information, professional development sessions, networking opportunities, marketing products, an effective industry voice and strong leadership to further their professional success. A highlight of February was the strength of residential -detached or single family home sales happening outside the city of Winnipeg. The 152 sales represented 30% of the total amount sold in February. While the Steinbach MLS® area led the way with 28 sales, it is worth noting WinnipegREALTORS® has recently welcomed rural real estate offices to its membership from Winkler, Gimli and Lac du Bonnet. Single family home sales of 505 increased 6.5% in February when compared to February 2018. Condominium sales were up as well with 107 sales, a 5% increase over February 2018 and 10% greater than the 5-year average of 97 sales. Other MLS® property types which outperformed February 2018 with double-digit percentage increases were commercial, single- attached and duplexes. The 34 single-attached sales represented close to 5% of total MLS® sales in February where residential-detached and condominium sales captured 70% and 15% respectively. Looking ahead to March, all three levels of government are releasing their annual budgets. The City of Winnipeg unveiled their operating and capital budget on March 1, 2019 with a proposed 2.33% property tax increase. The provincial budget comes down on March 7th while the federal government will release theirs on March 19th. Noteworthy this year is there has been a strong push from the real estate industry to urge the federal government to provide relief to millennials who were disproportionately affected last year by the mortgage stress test. Since 1903, WinnipegREALTORS® has assisted its members in achieving high levels of excellence in organized real estate by providing superior tools and services that enhance and build a vibrant real estate industry. Representing over 1,950 REALTORS® and other industry related professions active in the Winnipeg metropolitan area, WinnipegREALTORS® promotes the value of a REALTOR® and organized real estate. WinnipegREALTORS® provides its members with essential market information, professional development sessions, networking opportunities, marketing products, an effective industry voice and strong leadership to further their professional success. WINNIPEG - January MLS® sales of 634 increased 11% over the same month last year and 8% over the 5-year average for January. Dollar volume rose 12% to $175 million. The 1,783 new listings entered on the MLS® in January also resulted in a double-digit gain of 19% compared to January 2018. On a positive note, mortgage rates are remaining historically low with the Bank of Canada signaling a wait and see approach on any interest rate increases this year. Buyers have also had over a year to adjust to the B-20 mortgage regulation rules which came into effect January 1, 2018. No better example of affordable prices came by way of the condo sales activity in January 2019. In what is more the exception than the rule in our local market, there were 34 sales under $150,000 compared to 12 in January 2018. A number of these units sold for as low as $31,500 with total square footage of less than 500 square feet. 56% of total condo sales went for less than $200,000. For comparison purposes, 22% of residential-detached or single family homes sold for less than $200,000. On the other end of the price spectrum, the highest-priced single family home sold for $910,000 while a condominium sold for $832,229. WinnipegREALTORS® just held its annual forecast breakfast and indicated that sales should outpace 2018 while prices will remain stable. The condo property type in particular is experiencing an elevated supply of listings going into 2019, so will be one to watch closely. WINNIPEG - In comparison to a near record year in 2017, 2018 held its own with sales down 5% from 2017 and 6% from the best year on record in 2016. Sales of 12,773 are down less than 3% from the five – year average and 1% lower than the 10-year average. The 23,834 listings entered on the MLS® in 2018 rose 2% over 2017. There are 3,235 listings available for sale at the end of 2018. Speaking of prices, the average residential-detached or single family home sales price in 2018 was $321,945, a very modest increase of 2% over 2017. The chart below shows how each of the geographic areas within Winnipeg performed with respect to their average home sales price as well as the area representing rural municipalities. All areas saw slight increases over 2017 with the exception of the southeast area where its price equaled last year’s result. On February 6, WinnipegREALTORS® is proud to be hosting its Annual Forecast Breakfast. This high impact event provides more insights and details on what is happening in the local housing and commercial market with a look ahead to 2019. 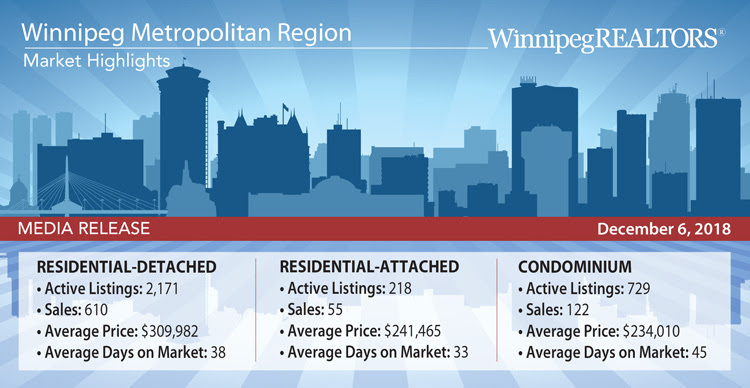 WINNIPEG - November MLS® sales of 864 are right in line with expected sales generated for this month. Sales decreased less than 2% from November 2017 and below 1% from the 5-year November average. This now makes for two months in a row of solid sales for the fourth quarter and this time of year. WINNIPEG - September sales of 1,046 were disappointing as they fell 12% in comparison to September 2017 and were off 9% from September’s 5-year average of 1,156 sales. On the other hand, new listings were up 6% and inventory of 5,134 listings grew by 11% over the same time last year.